NEO recently formed a head and shoulders pattern to signal that a downtrend is underway. Price has since broken below the neckline around $36 to confirm that bears have the upper hand. NEO has more room to go south since it could slide by the same height as the pattern and technical indicators suggest so. NEO broke below the neckline of its head and shoulders pattern while technical indicators confirm the downtrend. The 100 SMA has crossed below the longer-term 200 SMA to indicate that the path of least resistance is to the downside. This means that the downtrend is more likely to resume than to reverse. RSI is slowly crawling higher but is pointing back down again to reflect strong selling pressure. Stochastic moved south once more, after just making it halfway towards the overbought area. These confirm that sellers are eager to return and keep pushing NEO price down. NEO has more room to tumble since the chart pattern spans $36 to $42, which means that the selloff could last by the same height. In the event of a short-term pullback, price could find resistance at the moving averages’ dynamic inflection points around the broken neckline. Cryptocurrencies are back on shaky ground once more, with investor sentiment dampened by negative remarks from well-known economists and resurfacing trade tensions. This has also led to a pickup in demand for the US dollar, weighing on NEOUSD as a result. 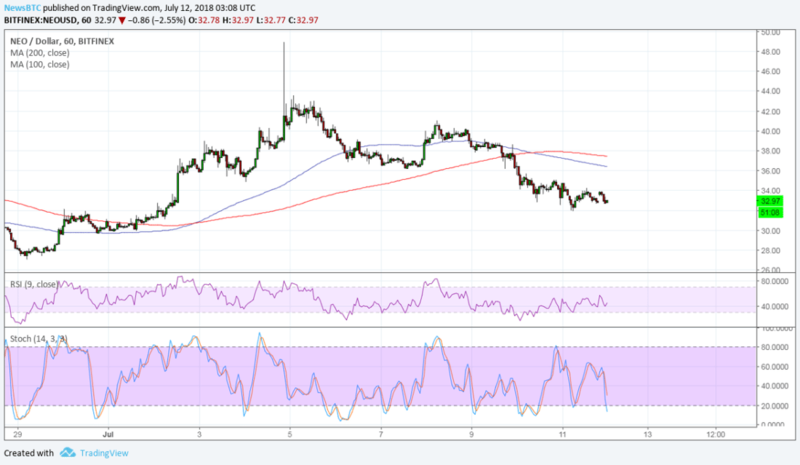 Ontology is reportedly getting ready to airdrop $40 million USD worth of ONT tokens in a free airdrop for all NEO token holders, so this might provide some support for this particular altcoin or at least prevent near-term losses. Ontology says that it is doing this to show its appreciation to NEO for “relevant cooperation and to support NEO community feedback”. The post NEO Price Watch: Reversal Pattern Confirmation appeared first on NewsBTC.